Happy New Year friends! I hope you had a wonderful holiday season and rang the new year in a delicious way! After the gluttony I indulged in over the holidays, it's no surprise I'm ready to detox and get back to healthier eating. Perhaps you're on the same page? The New Year is the perfect time to reset our mind and body after the holidays. For me, that means restocking my kitchen with healthier ingredients to make my recipes. Some favorite items I like to have on hand include fresh fruit and fat free yogurt. With these things on hand along with Krusteaz's fat free muffin mix, a sweet and healthy treat can satisfy my cravings in no time! This Banana Blueberry Yogurt Loaf is made with banana, blueberries and fat free blueberry yogurt, resulting in a tender crumb, full of fruit! 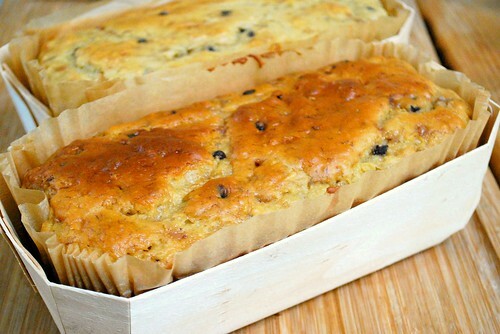 You can make this as a big loaf, mini loaves, regular muffins or mini muffins to help with portion control too. Head on over to Krusteaz to check out this heart healthy recipe and be sure to come back and visit me here! This year, I hope you can join me on the culinary adventure that awaits for 2017. There will be some new updates, changes and overall, lots of great recipes to share. Happy New Year and here's to a great new start of 2017!